Marvel Legends Vol. 4 005. On sale 8th November! 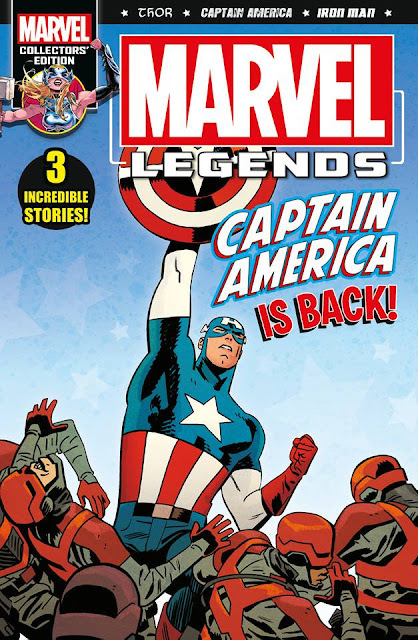 76 action-packed pages featuring Marvel’s ‘Big 3’ – Iron Man, Captain America and Thor! £4.50! Steve Rogers reclaims the mantle of the Sentinel of Liberty. But does the world still want Captain America?! Plus, The Search for Tony Stark continues, as ironheart and the Armour Squad try to track down Tony Stark and get more than they bargained for! And can Doctor Doom survive his battle against the Wrecking Crew and a host of supervillains?! Also, our latest Asgardian epic, The Death of the Mighty Thor, continues! The War of the Reamls rages and all the while the doom of the gods approaches! By Robbie Thompson, Chris Samnee, Brian Michael Bendis, Stefano Caselli, Alex Maleev, Jason Aaron Walt Simonson, Daniel Acuña, Chris Burnham, Becky Cloonan, Olivier Coipel, Russell Dauterman, Michael Del Mundo, James Harren, Andrew MacLean, Das Pastoras, Jill Thompson! Includes material reprinted from Captain America #695, Invincible Iron Man #598 and the Mighty Thor #700! Astonishing Spider-Man Vol.7 014. On sale 8th November! 76 pages packed with arachnid-action! Only £4.50! Venomverse begins! Venom finds himself drafted into a war to save the symbiotes from a deadly new foe! Plus, can Spidey and Deadpool survive Murderworld?! The killiest theme park EVER! Also, it’s a new school year for Anna May Parker. So why is her dad Peter Parker, the Amazing Spider-Man – also at Midtown High?! By Jody Houser, Nathan Stockman, Elliot Kalan, Todd Nauck, Cullen Bunn, Iban Coello. 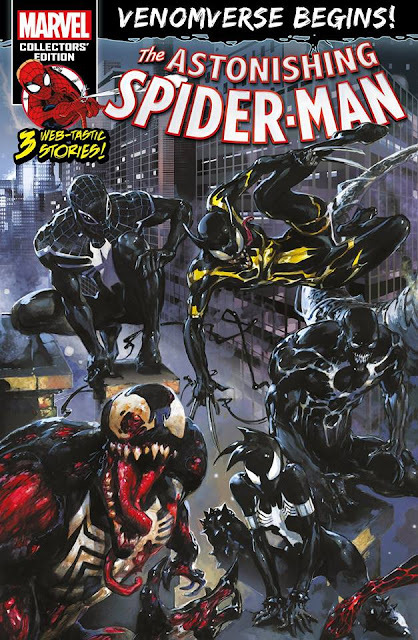 Includes material reprinted from Amazing Spider-Man: Renew Your Vows #16, Spider-Man/Deadpool #22, and Venomverse #1. 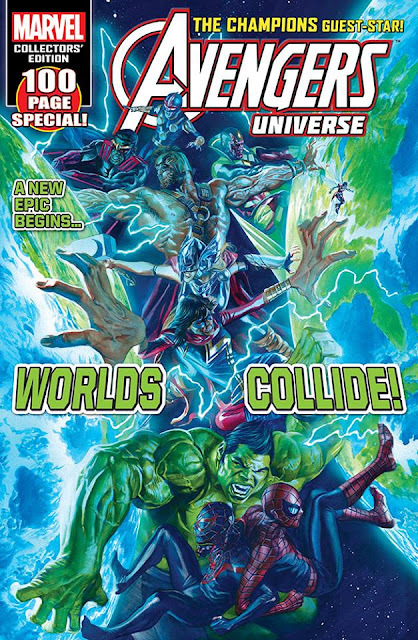 AVENGERS UNIVERSE #12. On sale 1st November. £4.50! 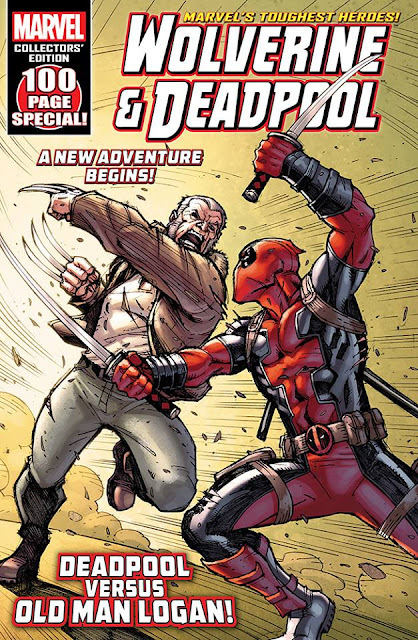 WOLVERINE & DEADPOOL #11. On sale 1st November. £4.50! Why does the Marvel Legends solicit credit Robbie Thompson? It should be Mark Waid, he's the writer of that Captain America story.